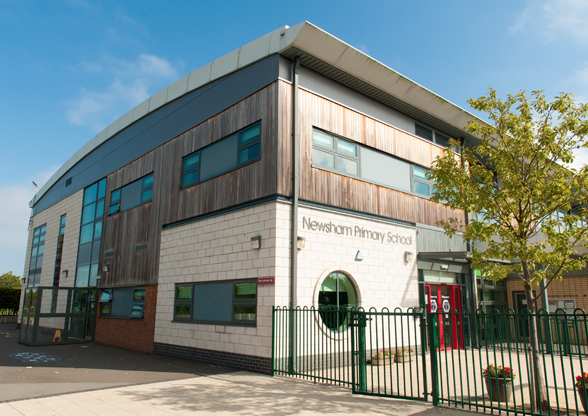 Newsham Primary School is situated in the south west corner of the coastal town of Blyth. We moved into new purpose built accommodation in September 2009. All of our brightly decorated classrooms are of a good size, containing modern equipment. Every classroom is equipped with an Interactive whiteboard, which teachers and pupils use daily to enhance learning. We are very proud of our ICT provision and have a 30 computer ICT room, 2 computers in each classroom and a trolley with 30 ipads, which is very popular with staff and pupils. Every computer in school is attached to our school network. We have a separate library called the ‘Lighthouse’. Children are encouraged to visit and enjoy a range of books in comfortable surroundings. We have a learning Pod on our Upper Deck and a ‘Life Raft’ on our Lower Deck. Our large hall is used for assemblies, dinners and PE lessons although we do also have a studio called our Rockpool for smaller dance/PE sessions. School dinners are served from our on-site kitchen. We have a range of modern PE equipment and a vast set of musical instruments. Our Lighthouse has a food technology area for small groups of children to enhance their skills. We currently have 433 pupils on roll. Our pupils are divided into 14 mixed ability and gender classes. We also have nursery offering morning and afternoon sessions. Our classes are named following our nautical theme, from the Pebbles in Foundation to Neptune and Atlantis in Year 6. The morning bell rings at 8.40 am at which time the doors open so the children can come into school for registration. A second bell rings at 8.45 am to mark the start of the school day. Lunchtime for the majority of our pupils is 12.15 pm to 1.15 pm. Our afternoon session is 1.15 pm to 3.15 pm when our bell goes to mark the end of the day. We offer a breakfast club every morning from 8.00 am till the start of the school day. Children receive a bowl of cereal, slice of toast and a drink of juice. More information about this club is available upon request. We also have an After School Activity Club (ASAC) which runs Monday to Thursday 3.15 pm to either 4.15 pm or 5.00 pm. Again more details can be obtained upon request. Interested in admissions click here.